A Northwestern University research team has found ways to stabilize a new battery with a record-high charge capacity. Based on a lithium-manganese-oxide cathode, the breakthrough could enable smart phones and battery-powered automobiles to last more than twice as long between charges. 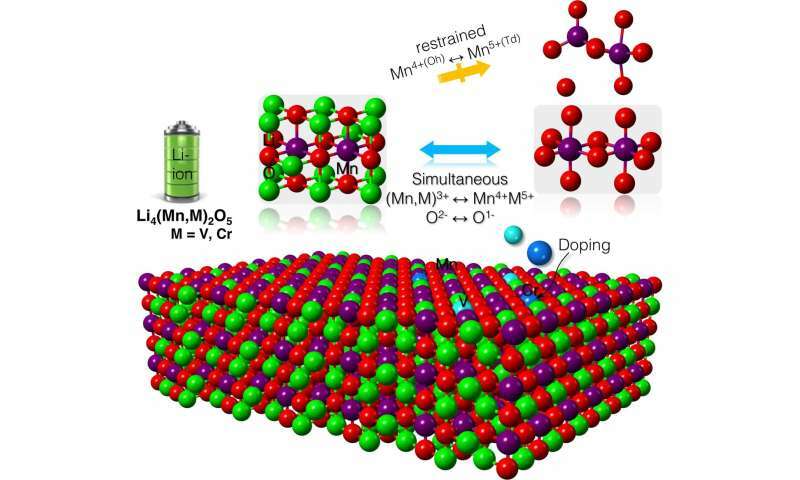 "This battery electrode has realized one of the highest-ever reported capacities for all transition-metal-oxide-based electrodes. It's more than double the capacity of materials currently in your cell phone or laptop," said Christopher Wolverton, the Jerome B. Cohen Professor of Materials Science and Engineering in Northwestern's McCormick School of Engineering, who led the study. "This sort of high capacity would represent a large advancement to the goal of lithium-ion batteries for electric vehicles." The study was published online May 14 in Science Advances. Lithium-ion batteries work by shuttling lithium ions back and forth between the anode and the cathode. The cathode is made from a compound that comprises lithium ions, a transition metal and oxygen. The transition metal, typically cobalt, effectively stores and releases electrical energy when lithium ions move from the anode to the cathode and back. The capacity of the cathode is then limited by the number of electrons in the transition metal that can participate in the reaction. A French research team first reported the large-capacity lithium-manganese-oxide compound in 2016. By replacing the traditional cobalt with less expensive manganese, the team developed a cheaper electrode with more than double the capacity. But it was not without its challenges. The battery's performance degraded so significantly within the first two cycles that researchers did not consider it commercially viable. They also did not fully understand the chemical origin of the large capacity or the degradation. After composing a detailed, atom-by-atom picture of the cathode, Wolverton's team discovered the reason behind the material's high capacity: It forces oxygen to participate in the reaction process. By using oxygen—in addition to the transition metal—to store and release electrical energy, the battery has a higher capacity to store and use more lithium. Next, the Northwestern team turned its focus to stabilizing the battery in order to prevent its swift degradation. "Armed with the knowledge of the charging process, we used high-throughput computations to scan through the periodic table to find new ways to alloy this compound with other elements that could enhance the battery's performance," said Zhenpeng Yao, co-first author of the paper and a former Ph.D. student in Wolverton's laboratory. The computations pinpointed two elements: chromium and vanadium. The team predicts that mixing either element with lithium-manganese-oxide will produce stable compounds that maintain the cathode's unprecedented high capacity. Next, Wolverton and his collaborators will experimentally test these theoretical compounds in the laboratory. Elon Musk will like this one. He promised to make [blood] cobalt free batteries for his cars. But surely lithium metal cathodes will eventually win the capacity race? Surely you mean lithium metal anode which has virtually no bearing on this very relevant research finding. Promise of lithium metal has been very disappointing due to its reactive nature and inability to stop dendrite growth, even with solid-state electrolytes. It may find use in some applications, but anything requiring fast charge will likely prevent use of lithium metal. Thankfully, researchers are beginning to understand importance of doping metal oxides and defect chemistry that have been so critical to development of semiconductors. Though most still do not understand the fundamental principles behind doping and selection of substituted atoms. There are several keys that include choosing similar ionic radius, coordination, and oxidation state +/- for induced n/p behaviors (cathode prefers p-type?). The ion chosen should at least reside close to its equilibrium oxidation state or else it will be irreversibly altered and even dissolve into electrolyte in corrosion regime. For rechargeable cells, the term "cathode" designates the positive electrode in the discharge cycle, as that's where reduction happens. So that's where the Lithium is. Yes I know its a pain. Years ago when I was at school the cathode was always the most negative, and an anode was always positive. Then they tried to be electro-politically correct and confused everybody.